Akshaya Tritiya is on of the biggest gold buying festivals in India and the Indian Post office intend to take advantage of that and capturing a lot of business by offering a six percent discount on various gold coins. 'Akshaya' means eternal and buying valuable items is considered to bring good fortune, luck or success so gold coins feature at the top of the list as the ultimate in wealth and power. Not all investors are large so the Post Office also focuses on the smaller investor, a wise move given that there are many smaller investors than large ones. Coins in the half, one and five gram range feature heavily with eight gram coins also on offer for those with just that bit more money to spend. This year, the festival starts on April 24 and the Post Office will be offering a rebate on a range of gold coins from 0.5 gram up to 50 gram of 24 carat with 99.99% purity. Jewellers say that a 25 percent increase is expected in this years Akshaya Tritiya gold buying festival ''The consumer mood is upbeat despite the ruling high price. We expect sales to be 25% higher,'' said the All India Gems and Jewellery Trade Federation chairman Bachhraj Bamalwa. He added that "though jewellers add new stocks during the Akshaya Tritiya festival, this year we are not building any new inventory till the government takes some positive steps and rolls back the hike in excise duty and customs duty proposed in the budget." Gold is the real Turkish delight in Turkey with the Turkish Government doubling the amount of gold lenders can hold in reserves compared to paper money. 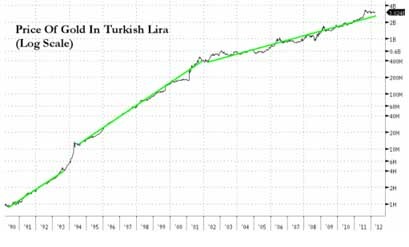 The shift from ten to twenty percent from On March 27 2012, means that Turkish banks are now able to use gold as a money reserve against foreign currency deposits. This change of policy followed turkey's banks receiving approval to hold some of their reserves as gold. Turkey, as has India and Vietnam before them, is turning to gold as a safe method to address their balance of payments problem. A 70-year-old housewife once said, "In an emergency, I can convert [gold] to cash and I don't have to wait for the bank to say the asset has matured." And it seems this is the growing attitude in Turkey, Another country now recognising the value of gold as money. As well as some US States now, Venezuela, Mexico, India and China are not the only countries recognising the value of using gold to back their assets. The traditional form of saving in Turkey has been gold and the government now wants to draw down on that asset in an effort to reduce the ten percent finance gap of GDP. The fact that it is using gold to do this is significant and indicates the growing dissatisfaction in paper money in the form of the Turkish Lira. If you want some of that ‘Turkish delight’ then the best way is to buy gold while it is still hovering in the lows. In defence of paper money it has often been said to me, 'you can't eat gold or silver.' Of course you can counter with the fact that one cannot eat money either but the truth is that such people really have no understanding of what gold and silver really are. The idea is that during an economy breakdown where food is scarce and costs are sky high it is useless to have gold or silver as you can’t eat it (in fact silver has very high ant-bacterial properties and so can be used to store water and milk for months at a time), and so will starve. Every currency, however, that has existed without any backing has collapsed. Paper has no value and paper currency unbacked has no value as evidenced by the continued deterioration in value. 98 percent of all currencies only exist as digital currencies residing in banks. Historically when there is a economic breakdown or collapse the value of the paper currency deteriorates down to near zero. Wheel barrels to cart paper money to by bread and potatoes or rice become the norm. This is something that those people who cry ‘you can’t eat gold or silver' have yet to understand. And tracking back on that cycle, how much will you have to earn in order to buy that loaf of bred or handful of rice? The short answer is a lot! It is often mentioned that in Germany during WW11 that people were carting around millions of Deutsche Marks and, only recently in Zimbabwe, billions of Zimbabwean dollars exchanged hands for basic staples such as rice and the like until the Zimbabwean dollar was effectively abandoned on 12 April 2009. Now in Zimbabwe only foreign currencies are used as a result of the Reserve Bank of Zimbabwe legalizing the use of foreign currencies for transactions in January 2009. That currency just went down the gurgler. No you can't eat gold or silver and you cannot eat paper money either. Incidently, it would not be advisable as paper money carries heaps of bacterial and one is very likely to get sick just from the contaminants quite apart from the ink, plastic etc contained within paper money. Gold on the other hand is used in surgery and medical procedures and silver is a known ant-bacterial agent. When it comes to a choice between the two, gold and silver is the money to use. Something more and more states and institutions as well as private investors are beginning to realise. Paper, as we know loses value and would be effectively worthless in an economic collapse. Gold on the other hand retains its value and a single ounce of gold will buy today exactly what it bought in the 1930s or anytime before or after that date. 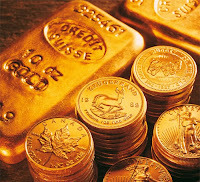 Gold as world currency reserve may seem, at this point, to be a bit far fetched but in fact it is closer than you think. Over the past few decades the US dollar has somehow been positioned as the world reserve currency despite the fact that no one in the world voted on it being so. And if they had, would they have favoured the US dollar over any other currency. Right now no currency looks at all stable enough to be considered a world reserve currency least of all the US dollar. This is beginning to be recognized by other countries now attempting to seek other methods of trade. The US government does not take too kindly having a replacement. Take Iraq for example. Back in 2000 Saddam Hussein stated he wanted to trade Iraq’s oil for Euros* and bypass the USD as a medium of exchange and we all know what happened a few short years later. If the SWIFT system is shut down to other countries then alternatives will be sought as no country is going to allow their trade to be stifled. As currencies are so easy to manipulate it is very likely more and more countries will turn to gold as an exchange medium resulting in an effective gold as world currency reserve scenario emerging. This is evidenced by the fact that many countries are stockpiling gold and ordering the return of their gold from overseas storage. Asian countries, such as China, India, Korea and so forth, always having a traditional appreciation of gold, are actively accumulating gold at an increasing rate. Take China for example. China is becoming increasingly anxious to divest itself of the billions of US dollars it has unwittingly accumulated and what better way to do that than with gold. According to the Daily Reckoning, "The gold price has increased for 11 consecutive years — a time frame during which, coincidentally, it has trounced the investment return of Berkshire Hathaway. Why? Because a new era of monetary destruction is unfolding throughout the Western world. That’s why a growing number of investors are devoting a growing percentage of their investment portfolios to gold and other hard assets." So the world is slowly moving to remove the US dollar. It is likely to be replaced by somethign that all countries can agree on and that is gold. 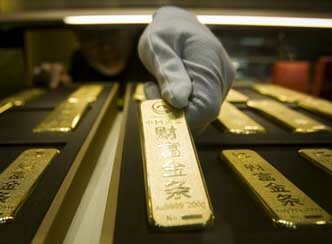 Gold cannot be manipulated or printed. It retains its value even as currency does not. Faith and confidence in currency is eroding fast and the more currency that gets printed the bigger the debts become and the less value it retains. Gold is money in the true sense of the world and those that buy gold will have value long after currency has done its dash and worth zero. Gold will then be truly the world currency reserve.